Guinness World Records named Maria Valentim Gomes as the world's oldest woman, on Wednesday (05/18/2011). 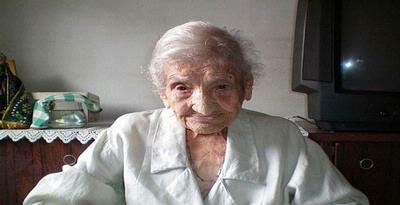 Valentim grandmother now aged 114 years 313 days. He toppled the previous record held by Besse Cooper from the United States. Cooper's 48 days younger than Valentim. Valentim was born on July 9, 1896 in Minas Gerais, Brazil. Married in 1913, she was a widow since 1946. From his marriage, he has a son who gave her four grandchildren, seven great-, and five great-grandchildren. It was they who had been accompanying daily. According to Editor-in-Chief of Guinness World Records Craig Glenday, as long as there is no "claim the success of Brazil in terms of longevity. " What often happens is that most of the claims "oldest person" is not accompanied by documents which can be accounted for. Earlier, a Brazilian woman named Sebastiana de Lourdes Silva admitted 116 years old. He claims to have the document as proof that he deserves the title of the world's oldest woman. However, the Guinness World Records has never examined the documents. Glenday said, "the title of oldest human applicant must show the original birth certificate, issued at least 20 years after birth, and proof that the bearer certificate it's really people who are in deed". When asked the secret of longevity, Maria Valentim Gomes reveals a simple recipe. He said, a healthy diet makes a long life. He started the day with a cup of coffee, bread, and fruit. Occasionally he enjoys wine.